Find out the latest from rurals and clubs. President Jane Stear welcomed everyone to the April meeting. Minutes of the previous meetings were read and approved and business attended to. Jane introduced Joan Nicol from Auchenblae, who came along to show us “How to Crochet”. Members were shown how to crochet a square and many of us went home eager to master the art of crocheting. Joan also brought along many items she had crocheted. She also judged the monthly competition which was an article in Beadwork which resulted: 1. Hazel Robson, 2. Ethel Foreman, 3. Aileen Ross. Flower of the month winner was Sheila Craigmile. Alison Meston proposed the Vote of Thanks to Joan and also to Angela Robson and Aileen Ross who provided a lovely tea. President Audrey Lowson welcomed members, friends and friends from neighbouring Institutes to an Open Meeting held in Corby Community Hall on Wednesday April 8. Audrey introduced Donald Graham and his wife who very kindly came along to show slides and talk on Alps and Alpines. Donald showed stunning slides of the spectacular mountain scenery and flora of Switzerland which he and his wife have visited many times. After tea, Donald judged the monthly competitions - 6 Lines entitled ‘My Garden’: 1. Kathleen Paterson, 2. Joan Thomas, 3. Sylvia Pike. Flower of the Month: 1. Pat Dunn, 2. Sylvia Pike, 3. Joan Thomas. The vote of thanks to Donald and his wife was given by Joan Thomas and Audrey thanked everyone for coming. St Cyrus WRI had a members night where they made four items to take home. Members made cards, paper baskets for Easter eggs and decorated a gift bag and a cupcake with help and guidance from Wilma Armitage, Ann Coutts, Frances Moir and Kathleen Masson. It was a very enjoyable evening with a lot of humour involved. Our next meeting is on the May 4 in the village hall at 7.30pm when the AGM will take place followed by a talk from Theresa Alampo from the local nature reserve. 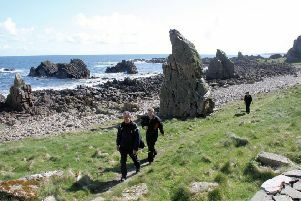 The Muchalls April outing was down to the “Mud House” in Logie. What a lovely outing - weather perfect and the host absolutely perfect. We were told all the history about the “Mud House”. We had a lovely tea - sandwiches, scones and cake. Business followed. Mrs Robertson gave a vote of thanks. Newtonhill WRI held their April meeting in Skateraw Hall on Thursday April 9 at 7.30pm. President Mrs Zena McLeod welcomed the members and introduced the speaker, Mr David McDonald, who gave a talk and slideshow ‘A Daunder Doon The Dee’, which was much enjoyed by the members. He started from the estuary of the Dee and took us all the way down the river to where the Dee enters the sea at Aberdeen Harbour. He discussed the wildlife seen along the way, fish, particularly salmon, otters, seals, a variety of birds, including the many species of birds of prey, deer and also how the banks of the river are affected by animals drinking from the river. He spoke about the decline of fishing on the Dee due to the lack of salmon and also the the use of the Dee for canoeing and other activities, which can cause upset to the fishermen. He spoke about the fish ladders which have been built on certain parts of the river to give the fish easier access up and down. He spoke about the Dolphins at the harbour end of the river and although they are a delight to watch they eat a huge amount of salmon per fish per day!